The Saffron Walden Knitted Maze: Yarnbombing with a Twist | Knit Like You Mean It. Well, people, Mr. Trask and I are back from our whirlwind jaunt to Oxford to find a home. We did find a place we liked, and applied for it – so send good vibes toward our rental application. It’s a terraced house in Jericho, just a handful of blocks from Port Meadow Designs and their cache of Manos del Uruguay yarn. Mr. Trask has already mentioned his concern about this more than once. The brief and hectic nature of our trip meant that I wasn’t able to go to Knit Nation or to check out Darn It & Stitch, but I will have 3 years in which to do such things. [I keep reminding myself of this, so I don’t pout. It’s so annoying when I pout.] However, I do have some nifty UK knitting content for you: information on the fabulous yarn-bombing being organized by Twist Yarns‘ Sophie Durlacher as part of the Saffron Walden Maze Festival. Sophie is a dynamo: she founded Twist (“your local yarn shop online”) last year and already she’s established enough to be accepted to the Knitting and Stitching Show 2011 in London in October (will I be there? Oh, yes, I will). Her company is an online yarn shop, but she also does in-home events, much as fibre space did when it first started out as Knit-A-Gogo. With all this going on, naturally Sophie needed something else to do. So when her town, Saffron Walden, started a maze festival this year, she volunteered to help them include a “knitted maze.” [Saffron Walden has two mazes in their town – a hedge maze and an ancient turf maze – and the maze festival will celebrate the town’s unique history with mazes and maze culture.] First, though, she had to figure out what a knitted maze might be. The planners initially had planned something two-dimensional, but Sophie thought she could reach out to the knitting community in Britain to make the knitted maze really special. 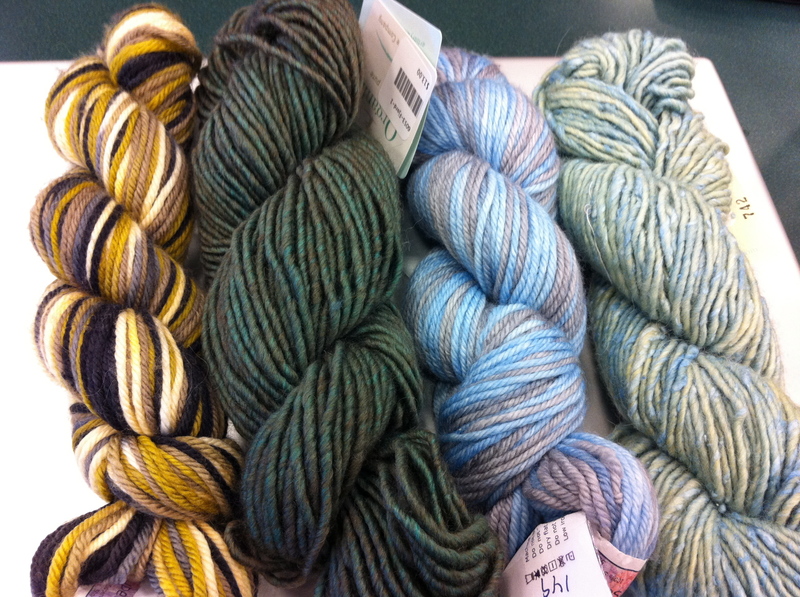 More Yarn Giveaway: Artyarns (first and third from the left) and Fibre Company (2nd and 4th from the left). “Using the existing mazes, we decided to recreate one of them, either by “bombing” it or creating an identical maze right next to it. The turf maze was the obvious candidate – it’s very near the centre of town on the Common. The Turf Maze is an ancient monument, so we are looking at re-creating it on the Common next to it, or even overlaying it, if the weather permits.” To get enough knitting for her vision, Sophie reached out to knitters in her town and far beyond, using word-of-mouth and a Ravelry group. Before long, the maze project had garnered a mention in beautiful UK magazine The Knitter and was featured in the local press. A knit-along on Worldwide Knit in Public Day attracted knitters throughout the day and got the project past the halfway point.You can see photos of young and old, male and female, new knitter and old hand knitting in the Creating the Knitted Maze Picasa album for the day. Want to help? If so, Sophie says, “Knit, knit, knit.” Strips should be between 9 and 12 inches wide and “as long as sanity permits.” I’m cheating by seaming together a few smaller strips, but you can do as Sophie does: ” I go for big yarn, fat needles, and an absence of style.” More creative folks are knitting with crime scene tape, video cassette tape (recycling! ), denim, even washing line. The sky’s the limit! I’ll be sending my strips off to the UK and would be happy to include yours – just send me an e-mail and let me know. As with the Knit a Tiny Hat challenge, anyone who donates a strip can choose whatever they like from my stash – and, let me tell you, there’s still some great stuff in there, including some Neighborhood Fiber Company Worsted and Malabrigo Merino Worsted, both in sweater quantities. Yum! Can you believe this yarn? Electric Kool-Aid Acid Test, from this year's Rockin' Sock Club. 1. 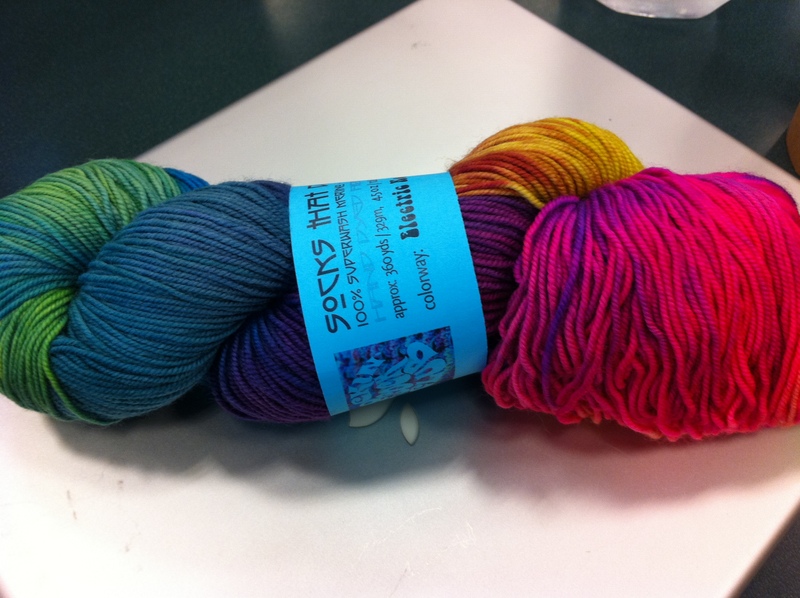 Artyarns Supermerino: two skeins, one in Color 149 and one in Color 140. 2. Fibre Company: one skein of Terra in Mint and one skein of Organik in Fjord. Comment on the blog by 5 p.m. on Wednesday, July 27 for a chance to win. And, hey, if you have a preference among the three yarny options, let me know what it is. I generally just pick at random, but might be able to find a way to get everyone chosen what they want. We can try, anyway, right? As always, the yarn has lived in airtight containers in our non-smoking, one-cat house, and will be frozen for 24 hours before mailing. If you want to contribute to the cost of shipping the yarn, go here, but please remember that you aren’t required to do that. Comment away! Have you ever yarnbombed? Do you wish you could? Kathleen – you are so generous with your give-aways! thank you! glad you’ve found a place in Oxford (positive energy being sent your way) & hope you’re continuing to feel better. as far as yarn bombing is concerned, i’ve never done it but have wanted to. living in a relatively small town town in indiana is my major obstacle – don’t want to be arrested or detained. as far as preferences for your giveaway, the Electric Kool-Aid Acid Test Socks That Rock Lightweight is just delicious!! as are all the others but the acid test yarn really caught my fancy. thanks again for the chance to win more of your delectable yarn! Hi – Sophie (aka the Dynamo) here. I just wanted to add that I am also happy to pay for postage from the US for anyone who wants to contribute. Can’t wait to meet you in person Kathleen and thanks for promoting the maze further and wider than I could ever have imagined. Twist Towers have spent a happy day at Fibre-East, a new regional fibre show and the interest in the maze was astounding. We also had random people pushing bags of knitting into our hands. Thanks so much! I am keeping a good thought that you’ll be able to replace all these fabulous goodies with equally lovely yarn when you’ve settled, and that the generosity you’ve extended is returned to you. What a cool idea. I’m happy to whip up a few strips and contribute – a perfect way to use my stash! The knitted maze project sounds ambitious, it’ll be interesting to see how the finished maze will look like. 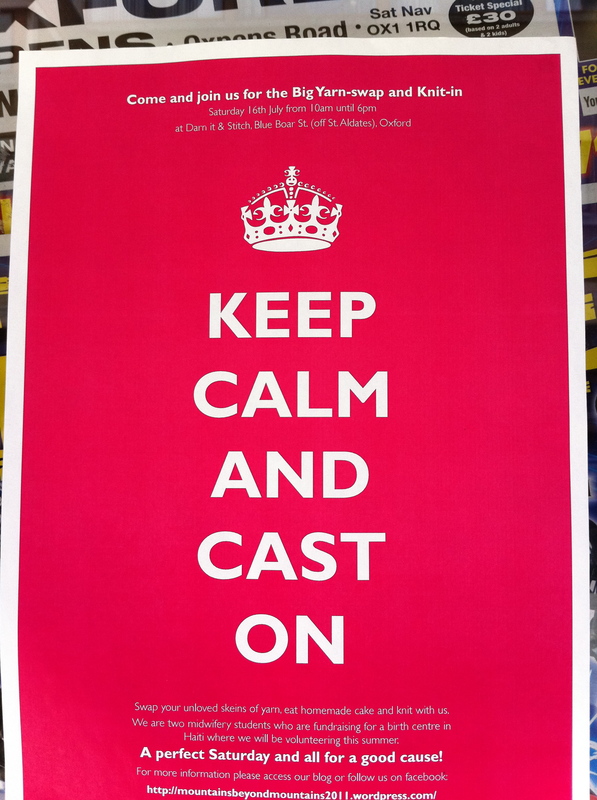 It’ll probably be big enough for the Guiness records? It’s great that the maze will be later recycled. I like the Fibre Company skeins the best, but all the yarns look nice. I haven’t yarnbombed and don’t really like the idea. It borders on vandalism (depending on what you yarnbomb). If you are wrapping a non-living thing like a car or a gate, it is probably okay, but covering a living tree in yarn is a big no-no for me. The tree needs to breathe and absorb sunlight. I’ve never yarnbombed and I don’t especially want to – it seems like a waste of yarn that could be used for practical purposes. This maze doesn’t really seem like yarnbombing to me, though. Hi Just a note to say that nothing used in the maze will be wasted. All natural fibres will be felted afterwards and either sewn into blankets or trauma teddies. Some people are knitting blanket sized pieces which will go straight to our local neo-natal unit afterwards. Anything which is fabric and can be stuffed into something else will be used to stuff trauma teddies. And anything which can’t be turned into something textile related will go to the local recycling plant. It is important to me that nothing is wasted and that in fact we are creating a life for unloved yarns which have been languishing in attics and bin bags for ages. Affiknity, I hear you on concern for trees, etc. The maze isn’t exactly yarnbombing since it’s being done with the express permission of the town, etc. But then I wonder how many yarnbombing projects these days actually do get permission – certainly the last one I heard of in DC was done with permission. Hello and Happy Knitting to all! I have only been knitting for three years but have a yarn obsession! It’s such amazing stuff, even when it’s still a hank. I like the 3rd & 4th hanks in the photo, and am even quite intrigued by the Kool-Aid Acid one. Wow. Bold. As for yarn bombing, our new local library branch has a small tree that was yarn-bombed with colorful wrap & “ribbon”. Going there and seeing it weekly makes me smile! Doesn’t seem like it’s hurting the tree at all; then I would have a problem with it. Now my daughter wants to make a wrap for the trunk of the tree we planted this spring, for when winter comes, so it can be “cozy & warm.” How adorable. Maybe I’ll let her tie on some of her handiwork, as small projects are her forte. I’m sending you good luck wishes for your rental application!! Your giveaway looks amazing! This is amazing content, what an interesting blog! I have to say I am absolutely obsessed with mazes, and if I was still living in the UK I’d be there in a heartbeat. What a fantastic idea! Thank you so much for the giveaway. All the yarns look amazing, so if I’m lucky enough to be picked, I’ll have whatever no-one else wants. And I’ll definitely contribute to postage! Hey! It’s pretty awesome you’re relocating to UK and going away your creative excess-books and yarn. I would be so excited to win either because I am beginning my yarn hobbies to add to my metalsmithing jewel designs. Thanks for a super chance to start connecting the dots! your stash is so pretty!